Sparse summer sea ice in the Arctic over the past five years has caused behavioral changes in Pacific walruses according to research published by U.S. Geological Survey and Russian scientists. The effects on the walrus population are unknown. Using a simple darting system, scientists attached radio-tracking tags to 251 walruses in the Chukchi Sea. The tags transmitted the animals’ whereabouts and whether they were in the water and feeding. Using the tagging data gathered from 2008-2011, scientists created detailed maps of the walruses’ seasonal movements and feeding patterns relative to the location and amount of sea ice. The study found that due to earlier melting of the ice in the summer, walruses arrived earlier to their northern feeding grounds on the broad continental shelf of the Chukchi Sea. When the sea ice over the continental shelf melted completely in the fall, they “hauled out” onshore in large aggregations and foraged for food closer to shore. Hauling out refers to the behavior associated with seals and walruses of temporarily leaving the water for sites on land or ice. The specific effects of these behavioral changes are not yet understood; however, it is known that while onshore, young walruses are susceptible to mortality from trampling. Additionally, hauling out onshore and using nearshore feeding areas may require more energy. The longer open water season in the Arctic is creating opportunities for shipping, tourism, energy production and other human activities in this remote region. Data from this study will provide resource managers with basic information on areas important for walruses, such as the Hanna Shoal region, as human activities in the Arctic increase. The areas of walrus foraging overlap with oil and gas lease blocks administered by BOEM. The information gained through tracking large marine mammals such as polar bears and walruses, is helping USGS scientists understand how disappearing Arctic sea ice is affecting the region’s ecosystems. The Arctic sea ice is melting faster than forecasted by many of the top climate models: the first ice free summer is now predicted to occur by 2035, perhaps as soon as 2025. 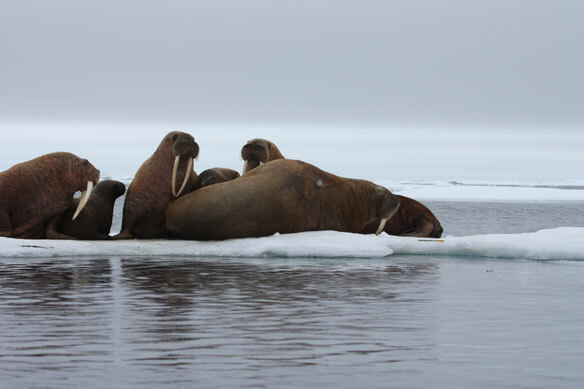 A new film, “Tracking Pacific Walrus: Expedition to the Shrinking Chukchi Sea Ice,” explores the walruses habitat and follows USGS researchers as they conduct their studies in the Arctic. The USGS-produced film contains exclusive footage of the large mammals in their natural habitat. B-roll footage is also available online. The study, published as this month’s feature article in the journal Marine Ecology Progress Series, is part of the USGS Changing Arctic Ecosystems initiative at the Alaska Science Center.